Baskin-Robbins has collaborated with Dunkin' Donuts for a new menu item. Dunkin' Donuts is a sister brand to Baskin-Robbins. Baskin-Robbins started offering its new Donut Ice Cream Sandwiches on September 1st. 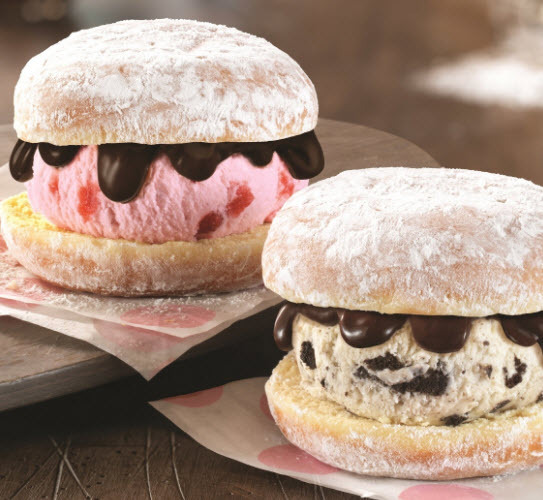 The treat features ice cream and hot fudge sandwiched between a powdered donut from Dunkin' Donuts. Customers can select the ice cream they want to use in the new menu item. Baskin-Robbins also announced that its new flavor of the month for September is Pumpkin Cheesecake. Dunkin' Brands Executive Chef Jeff Miller says in a statement, "With our new Donut Ice Cream Sandwiches, we've brought together two of the most delicious sweet treats from our brands, cool ice cream from Baskin-Robbins and classic Powdered Donuts from Dunkin' Donuts, into one amazing dessert. The best part is that guests can customize their Donut Ice Cream Sandwich with any ice cream flavor, including our September Flavor of the Month, Pumpkin Cheesecake."